Alyce Sport Fishing - Molokai's best deep sea charter fishing! 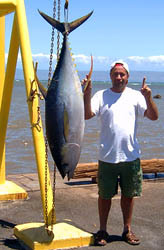 Alyce C Sport Fishing is simply the best deep sea charter fishing on Molokai, Hawaii. Ever dreamed of landing a 1000lb marlin? The fishing grounds off of Moloka`i- the most Hawaiian island- are the best in Hawaii and are producing the region’s largest fish. Come take part in an authentic Hawaiian fishing experience with Alyce C Sportfishing, which specializes in deep-sea fishing charters in Maui County’s “triangle”- south Molokai, Lanai, and the Penguin Banks- and Molokai’s rugged North Shore. Your guide to this experience is Captain Joe Reich, a knowledgeable longtime seafarer and a master of his craft. Captain Joe can help passengers target which variety of Pelagic fish they would like to catch- A’u (Pacific Blue & Black Marlin), Ahi (Yellow Fin Tuna), Mahi-mahi (Dorado), Ono (Wahoo), Aku & Kawa-kawa (smaller Tunas) - or just cruise to see what’s biting. The boat can accomodate groups of 6 passengers or less for a day of sun, ocean breezes, and epic battles against these majestic fish. Unlike many fishing charters, the Alyce C policy on caught fish is that guests can keep whatever they can reasonably make use of, so be prepared to visualize a great spread of grilled tuna or wahoo sashimi, if you have a place to cook it! 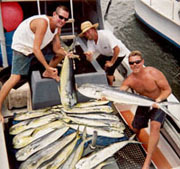 Alyce C Sportfishing offers competitive rates on ½ day, ¾ day, full day, and Round Isle packages. We also offer seasonal whale watching charters and provide all necessary gear. We fish with 50-80-130 Penn International Reels, and we troll with different lures and bait, depending on the area; passengers who have their own gear are welcome to use their own. Come to Molokai to get away from the hectic pace of life; come to Alyce C Sportfishing to combine relaxation and excitement! 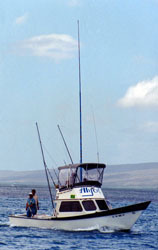 Alyce C Sport Fishing is simply the best deep sea charter fishing on Molokai, Hawaii. Whether you’re after big game fish like Marlin, Mahimahi, Ahi or Ono, Captain Joe will lead you to big fish. 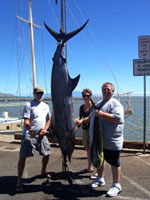 Charter, fishing, charter fishing, sportfishing, sport fishing, Hawaii, Molokai, deep sea fishing, Molokai fishing.